Rep. Dana Rohrabacher, R-Calif., speaks during a news conference on Capitol Hill in Washington, D.C., in 2013. California is crucial to the Democrats' hopes of taking back the House of Representatives. The party has targeted districts that are held by Republicans, but that Hillary Clinton won in 2016. Four of those seats are in the former Republican stronghold of Orange County. The big prize there would be toppling Republican incumbent Dana Rohrabacher, who has represented the 48th Congressional District for 30 years. But Democrats could be ruining their own chances. So many of them are competing there that they could dilute their strength in the state's unusual top-two system. Rohrabacher touts his proud past as a speechwriter for Ronald Reagan and toes the conservative line on issues such as illegal immigration. He has decried what opponents call sanctuary cities, saying that those who support them "are betraying the American people." Some of Rohrabacher's other positions, however, make him seem vulnerable, even to fellow Republicans. He voted against both the GOP tax cut and the omnibus spending bill. He recently lost some business support when he said that no one should have to sell their home to someone who's gay. But most controversial is his long support for better relations with Russia and his meetings with close associates of Vladimir Putin. Recently, Democratic voters crowded into a synagogue in Rohrabacher's district, eager to check out the candidates vying to replace him. Susan Becker knew what she was looking for. "I have to support the person who is most likely to win," she said. "It's just a shame that there are so many Democrats running, because we're going to split the vote." Here's why Becker's worried. California's primary system puts all the candidates on one ballot. The two with the most votes go on to November, regardless of party. But in their enthusiasm to oppose Rohrabacher and Donald Trump, eight democrats signed up, making it hard for any candidate to consolidate support. That's why Michael Kotick dropped out, though his name is still on the ballot. "We have to be really smart about the math," he said. "We have to make responsible decisions on behalf of the community and on behalf of the party." What made Kotick's decision so urgent was that, at the last minute, another Republican jumped into the race — Scott Baugh, a former Republican leader in the state Assembly and former chair of the Orange County Republican Party. Baugh has name recognition in this district where Republicans still have an advantage in registration. If Democrats can't rally around a single candidate, they may have no one on the November ballot at all. At the synagogue forum, there was an awkward moment when the moderator asked one of the candidates why he didn't just drop out and throw his support to one of his fellow Democrats. The question got a round of applause. Really, the only issue that the voters at this event really cared about was winning. And two Democrats seem viable. One is Hans Keirstead. He's a stem cell biologist, but more relevant at this event, he has the endorsement of the California Democratic Party. But that hasn't helped clarify anything. Democrats are split. The national Democratic Congressional Campaign Committee is backing Keirstead's chief rival, technology entrepreneur Harley Rouda. The 48th District is not the only place where Democrats' glut of candidates has imperiled their chances. In another Orange County congressional district, Democrats were going at each other so hard that the head of the state party brokered a truce on negative advertising. But since everyone competes on the same ballot, Democrats are attacking Republicans too. The idea is that if they can knock a couple of them down, it'll improve the chances of a Democrat making it into the runoff. Raphael Sonenshein, the executive director of the Pat Brown Institute for Public Affairs at California State University Los Angeles, says everyone's now trying to figure out how to game the system, including voters. For instance a voter might think, "Should I vote for a candidate I don't much like so that our party doesn't get shut out? Or vote for that person so I can shut out the other party?" Sonenshein says that the top two system was intended to make primaries less partisan. "I think it hasn't really worked too well this year." And it's not just Democrats who are facing a perilous primary next week. Republicans risk being shut out of both the races for governor and United States Senate. Democrats have high hopes to take control of the House of Representatives in the midterms. But to do it, they need almost every corner of California. The party has even targeted Orange County, a one-time Republican stronghold won by Hillary Clinton in 2016. 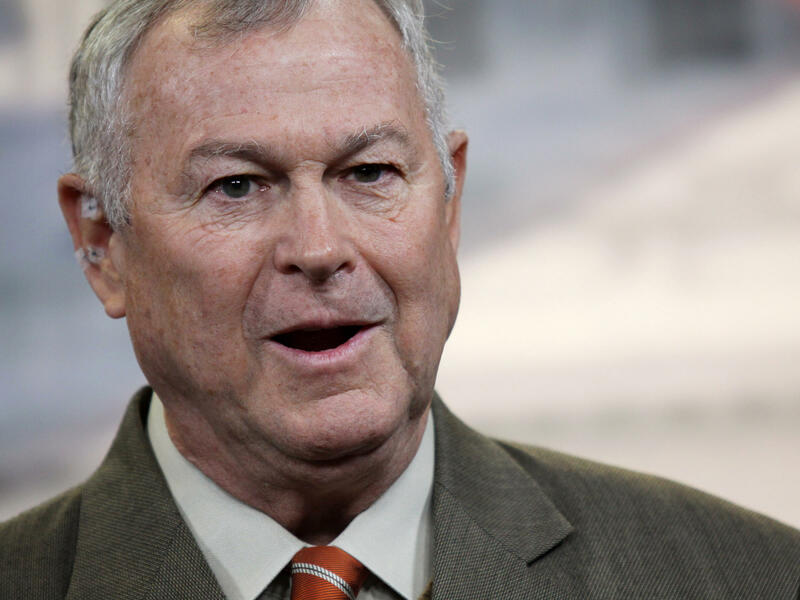 The big prize there would be toppling 15-term Republican incumbent Dana Rohrabacher. But California has this unusual two-tier primary system. And that along with an unusually crowded field of Democratic candidates could dash the party's hopes in next week's primary. Here's NPR's Ina Jaffe. INA JAFFE, BYLINE: Dana Rohrabacher touts his proud past as a speechwriter for Ronald Reagan and toes the conservative line on many issues - illegal immigration, for one. Here he is addressing the Huntington Beach City Council. DANA ROHRABACHER: Well, I would suggest that those who are advocating sanctuary cities or a sanctuary state are betraying the American people. JAFFE: Some of Rohrabacher's other positions, however, have made him seem vulnerable even to fellow Republicans. He voted against both the GOP tax cut and the spending bill. He recently lost some business support when he said that no one should have to sell their home to someone who's gay. But most controversial is his long support for better relations with Russia and meeting with close associates of Vladimir Putin. So recently, Democratic voters crowded into a synagogue in Rohrabacher's district, eager to check out the candidates vying to replace him. Susan Becker knew what she was looking for. SUSAN BECKER: I have to support the person who is most likely to win. It's just a shame that there are so many Democrats running because we're going to split the vote. JAFFE: Here's why Becker's worried. California's primary system puts all the candidates on one ballot and sends the top two finishers on to November, regardless of party. But in their enthusiasm to oppose Rohrabacher and Donald Trump, eight Democrat signed up, making it hard for any candidate to consolidate support. That's why Michael Kotick dropped out, though his name is still on the ballot. MICHAEL KOTICK: We have to be really smart about the math. And when candidates see that the math is getting crowded, we have to make responsible decisions on behalf of the community, on behalf of the party. JAFFE: What made Kotick's decision so urgent was, at the last minute, another Republican jumped into the race. UNIDENTIFIED PERSON: We need more from our representatives in Washington. We need Scott Baugh. JAFFE: Scott Baugh is a former Republican leader in both the state legislature and the county party, so he's well-known in this district. And if Democrats can't rally around a single candidate, they may have no one on the November ballot. At the synagogue forum, one candidate had to deal with this uncomfortable question from moderator Kevin O'Leary. KEVIN O'LEARY: Shouldn't you consider dropping out and asking your supporters to support one of the Democrats? JAFFE: You can hear what a popular suggestion that was. Really, the top issue at this forum was winning - just winning. And two Democrats seem viable. HANS KEIRSTEAD: Hello, Democrats. Good evening. JAFFE: Stem cell biologist Hans Keirstead wanted to show he had the official support to make it to November. KEIRSTEAD: I am the California Democratic Party-endorsed candidate. JAFFE: But while Keirstead has the support of the state party, the national Democratic Congressional Campaign Committee is supporting his chief rival, tech entrepreneur Harley Rouda. And Rouda's message to Keirstead should sound familiar. HARLEY ROUDA: I think the best thing he could do is drop out at this point. JAFFE: This is not the only place where Democrats' glut of candidates has imperiled their chances. In another Orange County congressional district, Democrats were going at each other so hard that the head of the state party brokered a truce on negative advertising. At the same time, they're attacking some Republicans running there. The idea is to narrow the field and make sure a Democrat makes it into the runoff. RAPHAEL SONENSHEIN: This is just getting really wild. JAFFE: Raphael Sonenshein, executive director of the Pat Brown Institute at California State University, Los Angeles, says everyone's now trying to figure out how to game the system, including voters. SONENSHEIN: For example, should I vote for a candidate I don't much like so that our party doesn't get shut out or vote for that person so I can shut out the other party? This was the kind of political gamesmanship that the top two was sort of advertised that it would save us from. I think it hasn't really worked too well this year. JAFFE: And it's not just Democrats who are facing a perilous primary next week. Republicans risk being shut out of the races for governor and United States Senate. (SOUNDBITE OF MATTHEW HALSALL'S "THE END OF DUKKHA") Transcript provided by NPR, Copyright NPR.